My project argues, through a case study on Hamlet, that tumblr users in the Shakespeare fandom have constructed their own Shakespeare that reflects both the demystification of the exception Author and the deconstruction of a monolithic, culture-controlling Academy. While tumblr users genuinely seem to enjoy Shakespeare’s work and value the texts immensely, they do not bring a sense of reverence to Shakespeare as typically presented in high school and college classrooms. They engage in the queer readings some academics pursue but that never reach a first-time reader of Hamlet. They place Hamlet next to Ke$ha without batting an eye. And they turn Hamlet‘s narrative into a series of emojiis. (Among other things). 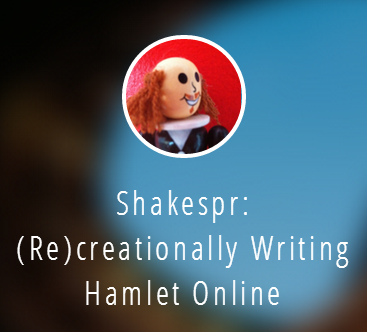 Often through collaborative writing , tumblr re-presents, remixes, and remediates Shakespeare. Along the way, the site recreates Shakespeare’s body of work as fun and flexible, and Shakespeare becomes Shakespr. I suppose I can say that I started this essay (without really knowing it) before I started this course. I have been on tumblr for several years now, and I have been pursuing Renaissance literature (particularly Shakespeare) for about the same amount of time. So, before the course began, I had already had on my blog several posts from other users about Shakespeare. Posts I found fascinating to view. When I began this course, I knew early on that I wanted to work with tumblr. As I’ll talk more about below, I think that tumblr’s interface – though it might take a bit getting used to – allows for variation in digital composition. In looking at the Shakespeare posts, I first continued my collection work. I followed as many Shakespeare blogs I could find, reblogged a bunch of posts about Hamlet, used my tumblr at first to curate. I then went through these posts to categorize the different modes users employed in discussing Shakespeare. It was at this point that I made the divisions: re-present, remix, and remediate. I organized the blog by dramatic vocabulary: preface, dramatis personae, three acts, an epilogue, and source materials. I then got a lot of excellent feedback from my group on how to guide my audience across these divisions. For me, the main appeal of tumblr is the way in which posts are divided. A post can be text, photo, video, a chat, a link, a quotation, or any variation/combination thereof. Tumblr can be extremely visually appealing as it integrates all of these sources. But, I would say even more than that, tumblr is immediately public in a way other blogging sites are not. If I tag a post “Shakespeare” the post immediately moves into the website tags, where anyone who is scrolling through or tracking the tag can see it. Users on tumblr also, then, read differently. They usually read in their dashboard – looking at tracked tags or what the people they follow reblog. Generally speaking, they do not encounter a blog by going to the blog home page, but by seeing one post by that user and then looking for more. The interaction this enables made me view my writing as much more public than I otherwise would (especially when I was writing my commentary directly on the posts of other users). Tumblr is not designed for a linear essay. One of the constraints I dealt with was how to link clearly and easily across all of my posts so that users both familiar and unfamiliar with the site could navigate my essay. The other main constraint is in the writing process on tumblr; when things are posted, they are (generally) complete posts. So I did have to respond to one confused (and slightly aggressive) anonymous message about how my blog was working. Overall, I have absolutely enjoyed this writing process and project, and might have already started a more long-term blog about being a graduate student more broadly…(plug). I look forward to talking about my work and hearing about everyone else’s! This particular post, written by several tumblr users over months and with nearly 70,000 notes (of both likes and reblogs), represents one way in which tumblr collaboratively composes. The post’s origin was in January 2011 with alullaby posting the quotation from Mary Dickson’s 1996 article hosted on PBS, “A Woman’s Worst Nightmare.” The piece as it currently stands exists primarily in this form, although there will be small variations across blogs as the person reblogging may add to the written material. It is not a static piece of writing, and, at first, I was hesitant to put it forward as a digital “essay” – as I do think of essays as writing with a clear start and end date and that will appear the same no matter who posts/reblogs it. But it is certainly a digital text. Courtneystoker reblogged the original post from radiantbutterfly and clicking on either url will bring you to the post on those users’ blogs. Collections seem to work uncreatively as Kenneth Goldsmith imagines the mode. If we think back to his presentation on the Brooklyn Bridge – he selects various pieces about it to make a clear, but implicit, argument. While the majority of my own tumblr essay differs from the collection as it has one author, a linear structure, and close reading, some of the work outside of the essay’s main body is in the collection of posts around Hamlet and Shakespeare original to the site. As a collection, this text works similarly to what Goldsmith describes in that there are a large variety of users putting vastly different thoughts on the table, from “Wow” (kittencoaster) and “men, read all of this please. including the commentary. 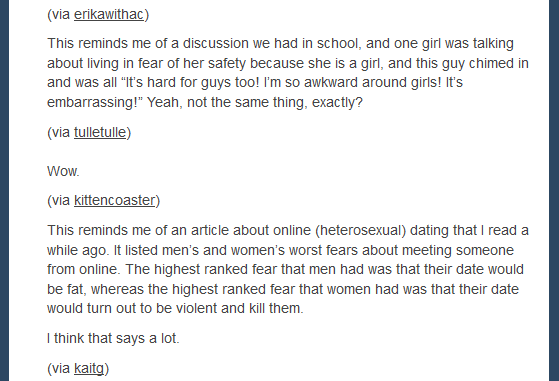 esp if you consider yourself a Nice Guy” (static-nonsense) to the longer narrative posts (someauthorgirl) and references to outside writers (becomingchichi). The comment that indicates how the piece has grown through the various commentary also stays in the most popular version of it (everythingbutharleyquinn). The collaborative process embraces different writing styles. Some users don’t use capitalization/proper grammar and spelling, some write extremely informally and casually use obscenity, and some take a more academic, critical tone while still describing intensely personal experiences. Collectively, the post embodies several elements of digital writing: an element of anonymity, a vast range in styles, collaboration, and a self-awareness of its own project. The prologue of my piece covers this in a bit more detail, but to summarize, I’m interested in how tumblr represents, remixes, remediates, and recreates Shakespeare. In doing so, I’m looking specifically at Hamlet on tumblr and how users read and rewrite the text. So far, I have a lot done in notes (whether my annotated bibliography or handwritten notes on the primary sources) and a lot done with the digital essay format itself. While I love tumblr, it is not always the easiest to work with when you’re trying to do something it wasn’t exactly designed for: structure an argument. What that boils down to is that I’ve spent significant time at the start wading through primary sources to find the specific ones I want to talk about directly, and many many more hours constructing the anchor posts themselves, and inserting the infrastructure of links, tags, metadiscourse, etc. Basically, this means that I still have substantial work to do in more of the writing itself. That being said, with what I have so far, I have gotten a lot of the more gritty, time-consuming work completed. At this point, feedback in three main areas would be of superb help. 1) The format: Like it? Does the first post sufficiently explain how to move through the essay? Did you get lost at any point in terms of where to go next? Also – I’m thinking of adding a page – perhaps in my about page – for tags. I’m hesitant to do that at this point because it’s a lot of post editing across the entire blog, but I will happily do so if you think that will help the piece as a whole (including the pieces that are not discussed within the main body of the essay). I’m also thinking about whether to include a “random” page that will take readers to a random post on the blog. 2) Sources: I’m not really working from any particular scholar (which is why the dramatis personae is under construction), but I do think I may include some of the larger ideas about fandom – such as Henry Jenkins’s “acafan” (academic fan) or some of Lessig’s work with remixing. Would the work benefit from these larger theoretical ideas? 3) In terms of my argument, I am positioning this not as a strict closed-form piece that starts with the thesis. Instead, I’m starting with my questions and moving toward my overall argument. For this format, do you think this structure will work for you as readers? Texts: Blogs dedicated to Shakespeare (or that frequently write around/rewrite Shakespeare) in various ways (text, video, fan fiction, tags, captioned gifsets, art…). I’m interested in looking at rewritten Shakespearean texts, but also at how “Shakespeare” as a cultural icon is rewritten on the site. My title is coming from a comment Baron makes about how the Internet has led to a surge in recreational reading and writing, and I thought there was a pun there to make especially suited for an essay involving Shakespeare. Question/Problem: At the most basic level, I’m asking: how is Shakespeare’s work (and “Shakespeare”) rewritten on Tumblr? In doing so, I’m looking not only at content – how do Tumblr users put pressure on Shakespeare in various ways (in terms of gender, sexuality, race, etc.) – but also at methodology – how do they do this? Tumblr has its own brand of literary criticism, and its own brand of creative fiction, that enable unique readings and rewritings of Shakespeare. Also, Tumblr’s interface allows for easy multimodal composition – some of the most interesting commentaries on Shakespeare (especially film adaptations in this case) are gifsets captioned in Comic Sans employing the “badness” in writing that Michael has posted about. Format: Tumblr! Where I can interact directly with the source. Model Texts: Tumblr pages aren’t necessarily the most visually appealing or intuitively navigable, and so I will be playing around a bit with how I want material organized. The blog will likely take one of two forms – vertical infinite scrolling or the other one here that I haven’t yet come up with a label for: http://loveyourchaos.tumblr.com/ and http://monk3y.tumblr.com/. Things I’m wondering about right now surround the blog format. Tumblrs are, like most blogs, set up in reverse chronology (unless I play around with the other form). I’m trying to think of ways that I can organize my posts so that I create a coherent structure. I’m also playing around with the idea of organizing my material so that the blog can be read either way – one which leads to some sort of “answer” and one that opens up to a lot of questions. I don’t know if I will be able to pull that off, though. My other question is around the writing process itself. Blog posts aren’t really meant to be revised as we think of revising in a Word document. Also, my composing process would be public. Kiley and I were chatting about this, and she suggested having essentially a “beta” digital essay, where all the work is done, and then revising as I see fit for a final product. I’m wondering what other’s thoughts are on that as well as I am still questioning what I want to do. Tumblr users are an especially responsive bunch, and so I am still somewhat invested in having that public, relatively immediate interaction as a significant part of the digital essay. Description under the link. Edited with Windows Movie Maker. Resident Tumblr ambassador here, this time drawing a connection between Tom Standage’s discussion of coffee houses as centers of social media and Tumblr. At first, I thought that Tumblr is more akin to the Devonshire manuscript (Standage 65). A post is “reblogged” across the site among users with varying degrees of anonymity that can add to it however they want (with images, audio, video, capitalizing, quoting and italicizing, quoting and bolding, quoting and italicizing and bolding…and capitalizing…). What intrigues me about Standage’s description of the coffee houses, however, is his observation that different coffee houses were the home of different subject areas: science, literature, law, sailing, and so on. It is this description that brought Tumblr to my brain as site users have “divided” the community similarly. 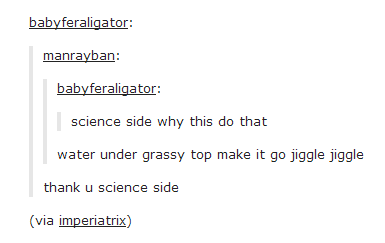 I see the “science side of tumblr” most frequently. (For a more scientific science side post, see: Shape Memory Alloy). Not being all that well-versed in science, I never know immediately whether the information is accurate (but there’s Wikipedia for that). All the same, users who want to find a funny, often irreverent, and generally speaking fairly accurate update on something to do with science can explore the science side tag or follow the ever-increasing number of blogs devoted to the science side. There is also always the fact-checker side of Tumblr. They arrive on a post about science, history, politics, you name it, and are often accompanied by a .gif from Mythbusters. A disclaimer here: I have no idea how right or wrong this post is, especially since the original poster’s blog has been deleted at some point over the past few years. What interests me about is that it does something that the written word simply cannot do and is highly persuasive – at least, to someone that is not a linguist and knows nothing about the origin of the Southern accent. I imagine that a written essay to describe the same point would either be overly simplistic (the LA accent is a French accent slowed down) or incredibly complicated (with a lot of linguistic jargon and symbols or accent marks of some sort). Less than two minutes of audio convincingly accomplishes what would take paragraphs of text to do to a lesser degree of success. Tumblr as a collection of coffee houses intrigues me because users can easily speak to one another through a variety of forms on one single platform. This is not to say that the “sides” of Tumblr, the various coffee houses, coexist peacefully. Tumblr users also divide themselves by primary interest – the main division being the “hipster” side and the “fandom” side. Every few months I will see a post by fandom blogs for fandom blogs that remind users not to criticize the hipster side, but to let them reblog pictures of rainbow hair colors and leggings with galaxy patterns in peace. Related to my post last week about marginalized voices and social justice on Tumblr, there is also a tension between the “social justice” side and the broader site. Gavia Baker-Whitelaw writes about the friction on the site: “While Tumblr’s userbase tends to skew younger and more politically liberal than, say, Facebook, SJ Tumblr has gotten a bad rep for being reactive and obnoxious. Accusing someone of being an SJ blogger is the Tumblr equivalent of calling someone a hipster: You may fulfill all the necessary criteria to be one, but nobody wants to own the title.” (“Meet the Trolls and Hoaxers of Social Justice Tumblr“). Her larger piece discusses one Tumblr user, forfuturereferenceonly, that ran a blog for about a year that mocked SJ Tumblr. I followed the blog during its run (it has been deleted) and never could call if it was an overblown social justice user or if it was a troll. Being on the internet, and being difficult to search through efficiently, Tumblr is difficult to divide into neat sectors, and I don’t think it should be. I do think, however, that the ways in which users discuss the divisions have led to an interesting parallel between the site and Standage’s coffee houses. As I’m interested in how things are rewritten, I am naturally interested in how rhetoric has changed in a digital format. What immediately comes to my mind is Tumblr. On Tumblr, people (of nearly any background you can think of) will often post a mix of written thoughts. They are often personal, but they are also often academic, political (based on reactions to legal changes, scientific discoveries, any and all pursuits). While some of these posts put forth the academic style I am most familiar with when I read about, say, a recent Shakespeare adaptation, more posts employ vastly different rhetorical strategies, born from the web and raised on tumblr. A piece in Shakespeare Quarterly will likely employ a highly formal, academic tone. It will generally be free of charged emotions. You know the deal. A Tumblr post is different. On Tumblr, you might get the same or nearly equivalent message (thesis – argument – project). What you will also get, however, is maybe an embedded video clip, more often a gifset, or a captioned photoset. Spelling is unimportant. Capitalization is even less important. In fact, a post with proper spelling, grammar, and capitalization looks suspicious on the site. It’s much more common to see (in all caps) “OMFG LET ME TELL U ABOUT THIS FILM. so it starts off….” The tags will take the emotions to the next level. The nuanced analysis stays the same. There is the same focused attention to detail based on argument, but these are personal blogs. And the personal elements remain.